Phoenix Rising Yoga Therapy offers people the opportunity to explore and heal their minds and bodies as one. The winter was tough on Lori Thomas*, a 36year-old San Francisco woman who had struggled for three years with infertility. After finding out that she was finally pregnant, Thomas lost her baby just as a friend announced her own pregnancy. For the first time in her life, Thomas couldn’t get out of bed in the morning and didn’t want to go to work. She felt hopeless and wasn’t sure how to pull herself out of the slump. “I felt like my sadness was genuine and real but that very few people understood how I felt,” Thomas explains. “Even my husband wondered when I would get over the disappointment.” That aloneness made Thomas feel even worse. An Astanga devotee, Thomas had heard of Phoenix Rising Yoga Therapy and decided to see if a few sessions could help her. Listening to your yoga The majority of a Phoenix Rising session comprises hands on and assisted postures with breath work and Rogerian dialogue [the therapist repeating back and validating what the client says]. The entire session supports a therapist being present to the client’s experience without judging or analyzing it. This support and unconditional positive regard from another person encourages the client to become loving and present to themselves. “We use very classic supported postures, such as forward fold, Child, or supported back bend,” James explains. “It’s similar to restorative work but often I’m physically supporting somebody. I may be holding the sacrum or shoulder blades.” James might use a yoga tie, up behind the heart or when someone is in cobra. As therapist and client are performing the assisted postures, the client continues to talk. James might prompt, ‘What’s happening now?’ and a client might begin with ‘There’s tightness in my hips,’ James will ask them to tell her more about that. “My client might say, ‘the last time I had this feeling was....’ It clues them into what’s going on with them,” relates James. “Some people makethe connection in that moment and other people make it when they walk out their door or a week later.” Phoenix Rising therapists call this “working the edge.” The edge is significant and it describes a stretch that is neither too intense or too gentle, but instigates an intensity and focus on the body part. “What is happening to your body is happening to your life,” says Michael Lee, M.A., the founder and creator of Phoenix Rising. “Your life is unfolding in your body but you don’t usually get to listen to it.” It is the edge that forces you to listen to your body. How touch was added to talk “One day I was doing partner posture triangle against the wall and my friend put his hand on my chest and I felt this burning in my hip. It wasn’t a physical pain, it was into another realm. He said just go with it,” explains Michael Lee, founder of Phoenix Rising Yoga Therapy. “I had a memory of being beaten up as a kid in a school playground. I really cried, trembled, and released it. With support and encouragement I was able to let it happen. I was able to see how I was holding onto this feeling.” That experience led Lee to think about the way his body—and other bodies—hold onto emotions. “At various times during yoga practice emotions arise that are somewhat out of your normal reality,” Lee continues. “I dismissed a lot of those things even after practicing yoga for many years. I would go on to the next posture and forget about it. Then, I started to play with the idea, because I figured if it happened with me, it must happen with other people.” Over a period of years Lee refined the poses and developed a method around how the therapist was to listen and respond to her client. “The key elements are and havealways been a loving presence, a stretch with an edge, and a breathing technique,” Lee says. In fact, Phoenix Rising has a set of 16 basic postures derived from traditional hatha yoga postures. “We have two to five variations for every postures so that a therapist can craft a session to support any body,” Lee explains. “Leaning on somebody is really a metaphor for your life.” It’s a physical validation because you’re not alone in your pose. That other person has that presence. This is what worked for Lori Thomas: The postures pushed her to really feel her feelings and, yet, at the same time, having her therapist with her gave her the validation she needed and the reassurance that she wasn’t alone. “I had the same feelings with her that I had alone, but her presence soothed me, while, at the same time, made me feel safe when I sat alone with my feelings,” Thomas explains. I knew it was bliss. I had never used that word before in my life. I couldn’t even imagine it was me talking.” “When I come back, I ask them to tell me about the rest of the wisdom they received,” James explains. “How are they going to let that show up in the rest of their day?” She suggests that they imagine themselves at a time in the future with this new concept in mind. Kaufman says that the end result is something extraordinary and bigger than yoga or therapy on their own. “You get into a place of knowing as opposed to a place of thinking,” Kaufman says, “which is a much more powerful place to be. Now I have the feeling that truly all the answers I really need are within me. As long as I can get into my parasympathetic nervous system and drop down into a quiet place then I’ll hear what I need to hear.” In fact, says Kaufman, it is this knowing versus thinking that brought her to Phoenix Rising in the first place. “I saw this line describing Phoenix Rising in a Kripalu catalog and I’ll never forget it: ‘Learn to discern the voice of the mind from the voice of the soul,’” Kaufman explains. “I’m very much an ‘in my head’ person and I didn’t know there was a difference between my head and my soul. I was interested to see if this was true.” Turns out, Kaufman says, that not only is there a difference, but that Phoenix Rising delivered on its promise. *The names of the clients in this article are pseudonyms. When it’s a scorching 99 degrees outside this summer the last thing on your mind is probably stepping into a hot yoga class. But hear me out! The perks might surprise you and have you doubling down on the sweat this season. If you’ve been working on getting into a full split, the summer months might be the perfect time for you to finally reach your goal. During the winter or in moderate temperatures we usually come into class stiff, and it takes us a while to warm up. This is less of an obstacle during the summer. When temps are high and we are irritatingly sticky from humidity our muscles and joints are actually looser and more flexible before we even step into the room. Use this to your advantage! This improves your flexibility on and off the mat. If you play sports during the warmer months hot yoga will not only improve your endurance in the heat, but it will also decrease your chance of injury. Tell that to your baseball loving husband! The best way to push toxins out of our bodies is to sweat them out, which we are already doing during the summer – that’s great for your internal organs and your skin! But during the summer we often have more BBQs and parties to attend, which leads to more sugary drinks and greasy foods. Doubling up on the detox will help your body cleanse quicker and leave you feeling lighter – not sluggish. Why should our technology be smarter than we are? When you practice hot yoga you are actually making your body smarter! Practicing yoga in high temperatures will help you to acclimate to summer’s heat by actually teaching your body to cool itself more efficiently through sweating. How cool is that? It also allows you to develop coping tools like learning to focus on the breath when things heat up, or sit in order to lower your heart rate. And the more that you practice you’ll find that you don’t mind the heat and you’ll actually enjoy being in the sun for all of those outdoor summertime activities. BONUS: Just one hot yoga class can burn between 500-800 calories, having you looking and feeling great all summer long! Although we love hot yoga year round, there are a few precautions that you should consider before your summer classes. They might seem obvious, but do not dismiss these as they are very important to your safety. + STAY HYDRATED! This is preached constantly, and rightfully so. During hot yoga you will sweat – a lot. This means that you are losing essential water from your body and it must be replenished. It is a non-negotiable. Your body will demand that you to drink water after your class, so you more than likely won’t need to be reminded to do so. Be sure to drink plenty of water before stepping into the room, and take frequent breaks during your practice to drink even more. + If you have asthma or high blood pressure, this is not your class. We offer many other classes during the week that will be perfect for you to breath deep and relax – this is not one of them. 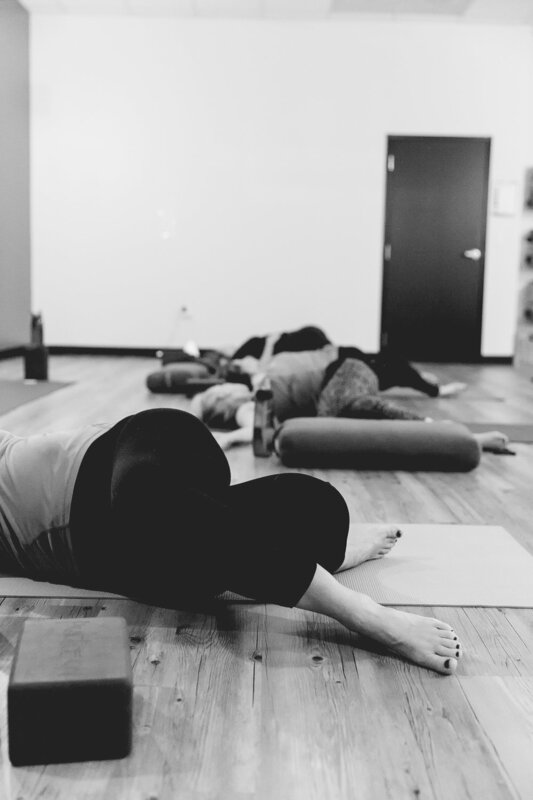 Come back for our Restorative Yoga class! + Don’t push yourself. If you feel lightheaded, dizzy or nauseated at any point during the practice, take a break. Drink more water, or get some fresh air. Your goal is to sweat, not to overheat. + Dress appropriately. All of our classes are judgement free, especially this one! You will need to wear tight-fitting clothes, as looser garments trap heat. Moisture-wicking clothes and headbands are best if you own them. Turmeric milk helps build immunity. Gives relief from a cough and cold. It is a good remedy for digestive problems. It is a liver tonic. Gives relief from autoimmune diseases. Pour all ingredients into a small saucepan and bring to a light boil. Whisk to combine ingredients. Reduce heat to low and simmer for up to 10 minutes. Strain the milk if you have large pieces of ginger, cinnamon, peppercorns, etc. To serve, add honey or a dash of cinnamon. We're working so very hard to pull all those last seemingly small details together. These small things turn out to be rather powerful as they are the reason for our delay. Right now you can do a few seemingly small things to support the victims of the recent hurricane causing devastating floods in Texas. Those small acts of kindness can turn out to be rather powerful. Our lovely instructor, Dani's church has organized a supplies drive. Visit FREEDOMFORHOUSTON for details on how to help. We're counting down to our new home! We're really close. But we've hit another snag we feel warrants our careful consideration. It's regarding the wiring of our new electrical panels. We want you to know we're doing our due diligence to open in a timely manner but without cutting any corners. Our last class in the Loft is Wednesday Aug 23rd. We'll announce our opening date just as soon as we have our all clear for occupancy. Our journey to 4625 Wilkinson Blvd has been one with lots of twists, turns, ups and unfortunately downs. We can see how our journey as a business and as a community isn't about arriving to one destination but rather an unfolding of newness. A new address yes, but also new beginnings, new relationships, new energy, new opportunities. The time has come to say goodbye to our current space. No April Fools. We've come to a season of TRANSITION. The space between one place and the next. The in-between. The season that's both the end and a beginning. Transition is a part of life. However, not often a favorite. Like moving your fridge, transitions can be messy. Once cleaned up and sorted we can emerge better having journeyed through the transition. This summer, dive in and transition with us. We'll be exploring all aspects of liminal space; honing our equanimity skills (ability to maintain a steady state amidst chaos) giving lots of practice to those pesky transitions between postures. We guarantee you'll emerge better having journeyed with us. You can park in '10 Catawba Parking'. We're inside the wood doors, up the stairs to the left. Our schedule will be kept up to date online & the Tula app. We'll be creating our own heat. All classes will be held in a comfortably warm room. Don't worry, we can still keep it on the cooler side for those that prefer. We're going cash-free. Please register online prior or plan to pay electronically. Get Your Greens, Find Some GOLD! NEXT WEEK! When you join us for a class Monday March 13th - Saturday March 18th we'll have our Sweet Greens ($5.50) available for purchase. You might just find GOLD! Each day one cup will have a gold sticker. The lucky yogi who finds the golden sticker will win an awesome prize of the day!